WASHINGTON, DC, September 10, 2010 (ENS) – To help improve water quality in the Potomac River and the Chesapeake Bay, the U.S. EPA has reissued an operating permit for the Blue Plains Advanced Wastewater Treatment Facility that requires a steep cut in nitrogen discharges. The five-year renewal of the Clean Water Act permit calls for the District of Columbia Water and Sewer Authority, known as DC Water, to upgrade Blue Plains to achieve a 45 percent reduction of nitrogen discharged from the plant. The new permit sets limits for nitrogen, bacteria and trash controls in combined sewer overflows. DC Water is already achieving the phosphorus removal requirements at Blue Plains. Excess nitrogen harms fish and wildlife by reducing the amount of oxygen, clouding the water, and depleting underwater grasses and crucial natural habitats in the Potomac River and the Chesapeake Bay. Under its existing permit, Hawkins says Blue Plains was operating under its limit of 8.5 million pounds of nitrogen per year. The new limit is 4.7 million pounds, which will require cutting-edge technology. The plant modifications must be completed by July 14, 2014 so that the pollution cuts in the new permit can be fully achieved in 2015. Garvin is confident this deadline can be met. “DC Water through its early actions to enhance treatment levels at this facility is clearly a leader in the Bay restoration,” he said. 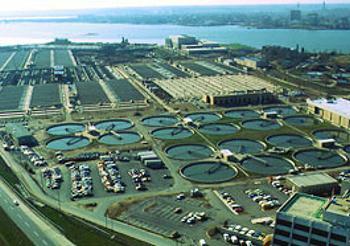 The largest advanced wastewater treatment plant in the world, the Blue Plains facility is the single largest point source discharger of nitrogen in the Chesapeake Bay watershed. Blue Plains treats wastewater for some 1.6 million people in the District of Columbia, Montgomery and Prince Georges counties in Maryland, and Fairfax and Loudoun counties in Virginia. About $1 billion has been spent on upgrades to Blue Plains during the past decade, and an additional $950 million is budgeted for the new nitrogen removal facility. That improvement in Potomac River water quality was documented in a study published Tuesday by scientists with the U.S. Geological Survey and England’s National Oceanography Centre. “Improvements to plant communities living at the bottom of the river have occurred nearly in lock step with decreases in nutrients and sediment in the water and incremental reductions in nitrogen effluent entering the river from the wastewater treatment plant for the Washington, DC area,” said USGS scientist Dr. Nancy Rybicki. Healthy beds of underwater plants increase oxygen and maintain clear water with low total suspended sediment in the river, the scientists have found. 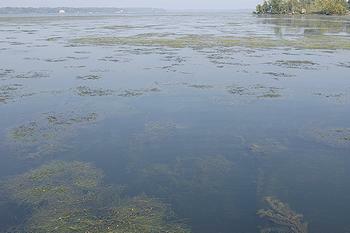 “Upgrades to the wastewater treatment plant have benefited submerged aquatic vegetation habitats 50 miles downstream. These findings underscore the benefits of nutrient reduction efforts on a major tributary to the Chesapeake Bay,” said Rybicki, who has been conducting research on the Potomac River since 1979. Ed Merrifield, president of the nonprofit Potomac Riverkeeper, says the study showcases environmental gains but that pollutants still remain.